This is the column or gynostemium. It's the fusion of the male portion (stamens) and female portion (stigma). It appears on the center of the flowers, just above the lip, it is at the apex of all six parts. In Cattleya species, the column is big as a pencil and 2,5 cm long. In a slipper orchid is round and flat an is called a staminode. In the majority of orchids the grains of pollen are collected in small masses called pollinia which is located inside the anther that is a "box" where the pollinia are kept and it is located on the tip of the column. The ovary is situated just bellow the anther in a short stem called pedicel. 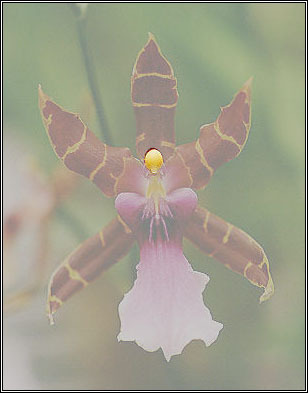 It is not fully developed until the flower is fertilized. The stigmatic surface is the place where the polinia are deposited by the pollinators. It's the beginning of the channel which carries the pollen to the ovary.